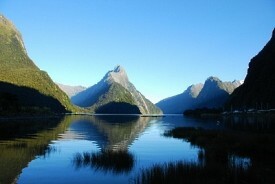 Fiordland is the largest national park in New Zealand and arguably the most spectacular. For over thousands of years glaciers have cut into the mountainous area, and the sea has flooded in and filled up the cracks to make a stunning landscape. One of the most popular activities is tramping, and the Milford Track is world-famous for it. Although it demands at least a five-day excursion, there are other shorter walks that allow you to enjoy Fiordland’s dramatic beauty. Te Anua, the commercial center of Fiordland, offers accommodations such as restaurants and shopping.